Arno Elias, Giraffe Duet was taken in Samburu, Kenya. 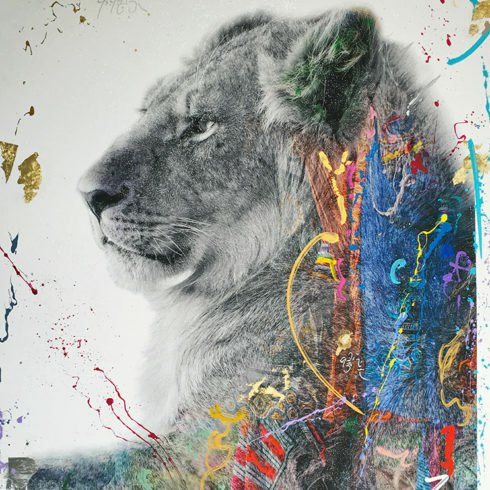 Arno Elias, Giraffe Duet is an archival pigment print hand embellished with paint, gold and silver leaf, and diamond dust. It is signed, titled, dated, and numbered on the back from the edition of 12. 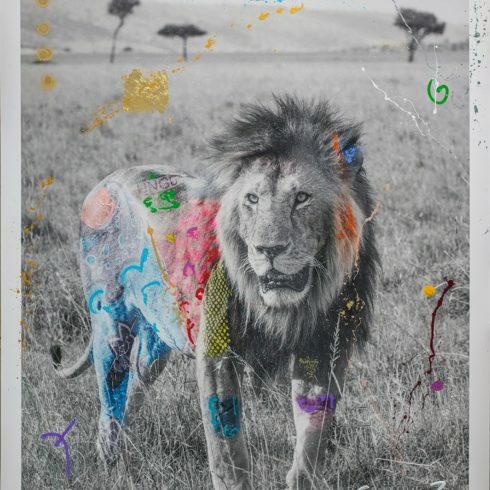 Founded by Artist and Photographer Arno Elias, I’m Not a Trophy is an organization that is dedicated to creating greater awareness for the rapid extinction of endangered species around the world that believes in saving and protecting the future of wildlife. Silently going extinct, Giraffes are the world’s tallest and most gentle giant. Towering over African’s plains, giraffes are social peaceful animals and are a necessary tourist attraction and economic drawcard. The 2,000-pound, 20-foot-tall giant with hooves the size of dinner plates, can deliver a damaging kick. These long-necked megafaunas have been silently racing to extinction largely because they draw little global attention compared to the other dwindling species. The Giraffe tail is desired for a good luck charm. The head and skin are removed from the giraffe to display as an exotic trophy. The price of trophy giraffe kill can cost from $1,800-$3,800. Arno Elias, Giraffe Duet was taken in Samburu, Kenya. 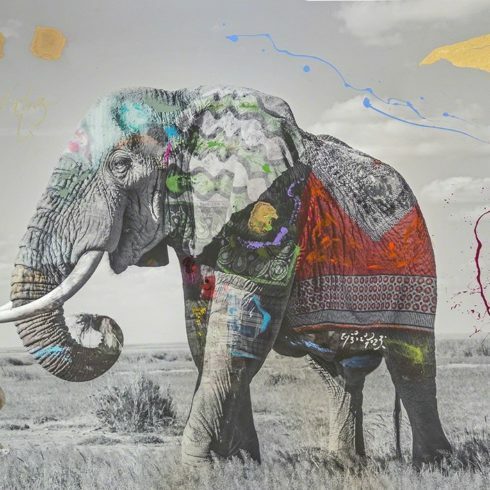 Arno Elias Giraffe Duet is an archival pigment print hand embellished with paint, gold and silver leaf, and diamond dust. It is signed, titled, dated, and numbered on the back from the edition of 12. 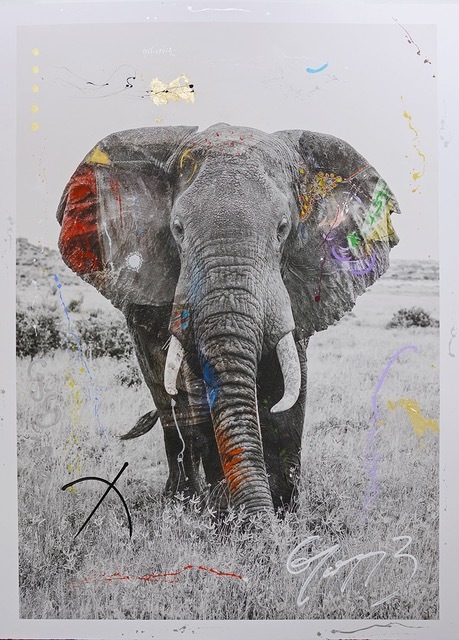 Founded by Artist and Photographer Arno Elias, I’m Not a Trophy is an organization that is dedicated to creating greater awareness for the rapid extinction of endangered species around the world that believes in saving and protecting the future of wildlife. Arno Elias was born in Paris, France. He is a multi-talented music composer, painter, photographer and activist Elias is the Founder and Photographer of I’m Not a Trophy, an organization that is dedicated to create greater awareness for the rapid extinction of endangered species, Featuring Super model and Actress Cara Delevingne as the first-ever brand Ambassador, The Global Launch in June 2016, achieved World-Wide recognition from top editorial outlets Elias was chosen by Brigitte Bardot to compose music for the Brigitte Bardot Foundation, which was created to help protect animals from abuse. Elias is also known for his compositions and productions of the globally renowned Buddha Bar music. He produced and composed world hit songs such as Amor Amor and El Corazon He also composed the Musical Score for the United Nations Organization in New-York, a Campaign for UNICEF called “For every Child” with recording artist Shakira Elias’ creative talents did not stop at his prodigious musical career, but continued into his artistic career, leading him into the world of painting and photography. Working alongside Jean Paul Gaultier and Mario Testino in the fashion industry further Influenced and informed his creative direction. 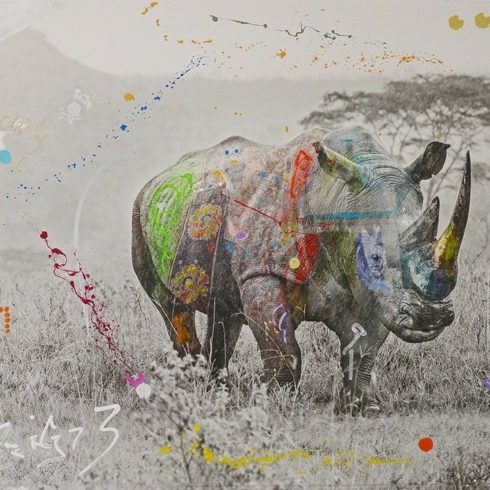 In 2011 Elias started “The Lost Series.” The collection is a crystallization of Elias’ mixed-media techniques and the powerful images he captured during his solo world photographic tour. To date Elias has exhibited in Paris, New York, Miami, Basel, London, Los Angeles, San Francisco, Dubai, St Barthelemy, Aspen, Singapore.